Written by Scott Joseph on 28 January 2019 . Central Florida has a new Margaritaville, and depending on where you stand on the Salt! Salt! Salt! spectrum you’ll either find that thrilling or horrifying. 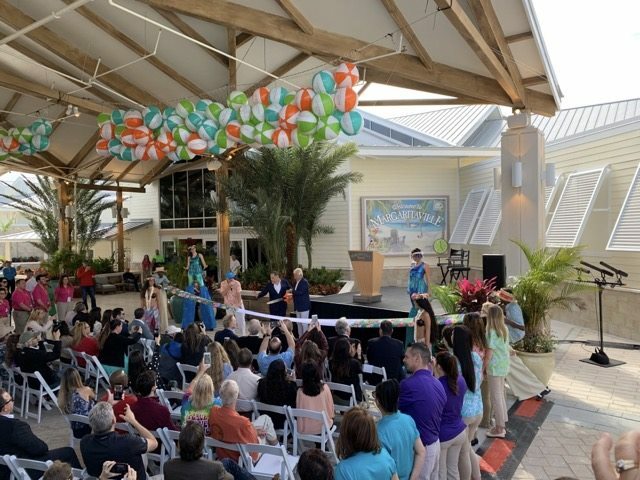 Margaritaville Resort Orlando had a grand ribbon cutting ceremony last week to officially open the Kissimmee hotel. Yes, of course there are restaurants (though some are open only to resort guests). But don’t expect to find a Cheeseburger in Paradise — that food item is trademarked elsewhere. There’s no Jimmy Buffett, either, though you’ll certainly hear his music playing. And before you ask, no, there is no relationship between the Kissimmee resort and the Margaritaville restaurant at Universal CityWalk. I obviously don’t understand the intricacies of branding and intellectual property. Everyone is waiting for the announcement of the opening date for Jaleo, the José Andrés at Disney Springs. The arrival of a truck should be a good sign, right? But unfortunately it isn’t a moving truck but rather a food truck. Or at least a food truck concept. It was announced last week that Jaleo will have attached to it a brick and mortar version of Pepe, a food truck owned by Andrés’s ThinkFoodGroup. It will serve a menu of hot and cold Spanish-style sandwiches. As for when Jaleo will open, I’m hearing that we should have a date by the end of the week. Stay tuned. Do young people know what stay tuned means? 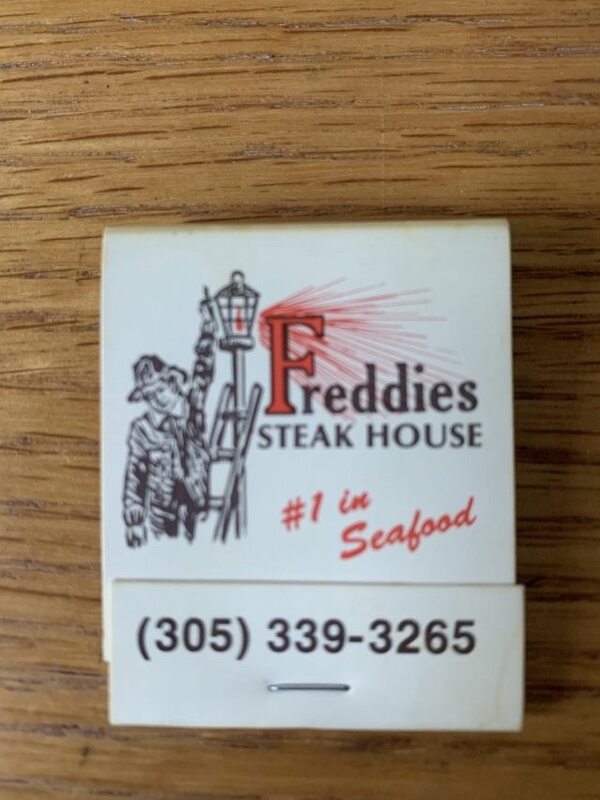 Do you remember Freddie's Steak House? Written by Scott Joseph on 25 January 2019 . I wanted to light a fire the other night and I couldn’t find the clicker. That’s what I call the long-handled butane lighter with the trigger. Couldn’t find it anywhere, so I had to go the analog routed and use a book of matches. I reached up into the cupboard to the tall stein I store old matchbooks in and pulled down a piece of Central Florida dining history. Do you remember Freddie’s Steak House? For many years it was a mainstay for local diners. It opened in 1943 as a roadside diner and was purchased in 1960 by Steven Larsson who turned it into a fine steakhouse. It was in a freestanding wooden structure at 7355 U.S. Highway 17-92, just south of State Road 436, in Fern Park. It was old-school steakhouse and even served a complimentary relish dish to each table. Larsson sold the restaurant in 1977 to a partnership, which leased the name and concept to other restaurateurs. It closed in 1988 — the year I came to town — but reopened in 1989. I don’t remember much of my review of it that year other than an observation that most of the patrons “looked as though they hadn’t had a steak since breakfast.” It closed soon after. It reopened again in late 1991 and I went back to review it. My article ran in Florida magazine in the Sunday Sentinel on Jan. 5, 1992, along with a notice in the front of the paper that read: “Freddie's Steak House in Fern Park, reviewed in today's Florida magazine, closed last week. Due to publishing schedules, it was not possible to change the review. The magazine is printed in advance of the date of publication.” My review wouldn’t have done much to encourage the owners to keep it open. After it closed, there was a move by one of the property’s owners to turn it into a strip joint, but Fern Parkers protested. I seem to remember one or two other concepts giving it a go there with little success, but eventually the place was boarded up and razed. I’ve been collecting matchbooks and boxes from restaurants for decades. I don’t look at them often, but it’s always fun to be bring back memories when I grab one, as I did Freddie’s. 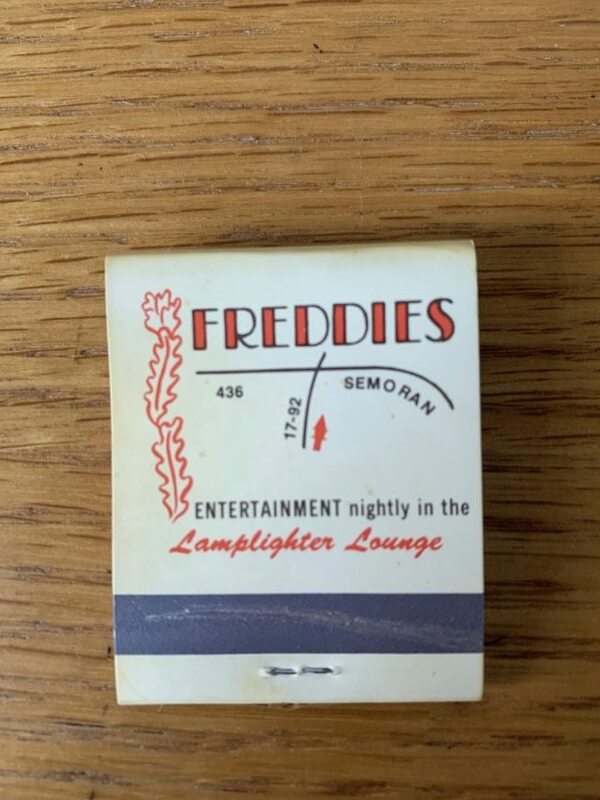 By the way, I don’t know why it’s Freddies on the matchbook. The missing apostrophe would make it seem that there were multiple Freddies involved. But no, there was only one Freddie’s. All of this is to remind you that we’re currently accepting votes for the Best Steakhouse in our Foodster Awards for Independent Restaurants. Click here to place your vote. Not sure how Freddie’s would fare in the poll — or if it would even be on the list. Thirty years ago, it was probably just one of a handful of steakhouses (including Linda’s La Cantina, which is indeed on our list of finalists) so it might have had a shot. But I think the quality of our steakhouses today is a whole lot better. What about you? Do you remember Freddie’s Steak House? Written by Nicole Spooner on 25 January 2019 . 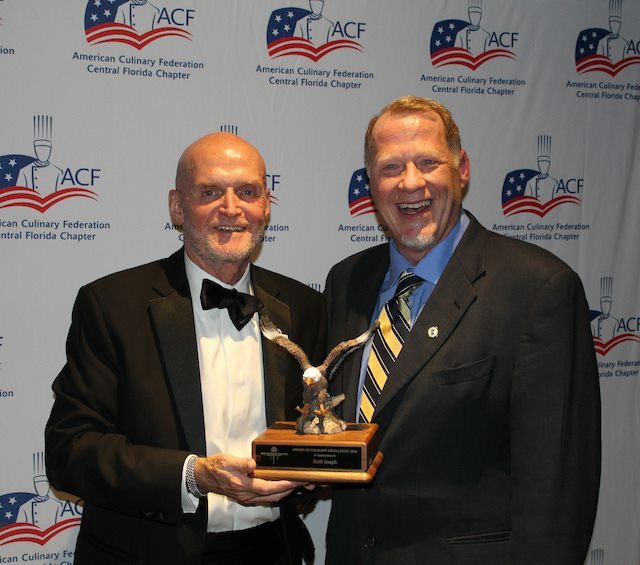 The American Culinary Federation Central Florida Chapter presented longtime restaurant critic Scott Joseph with its 2018 Achievement in Culinary Excellence Award at its annual president’s gala Sunday, Jan. 20, at Isleworth Country Club in Windermere. Chapter president, Brian Frick, shown above with Joseph, presented the award in recognition of his work with the chapter in establishing Scott Joseph’s Sous Chef Challenge: The Next Big Thing, a cooking competition held in conjunction with the Florida Restaurant and Lodging Show at the Orange County Convention and Visitors Center. Joseph has been reviewing restaurants in Central Florida for 31 years. He was the senior critic for the Orlando Sentinel for 20 years before forming Scott Joseph Company, which publishes the online site Scott Joseph’s Orlando Restaurant Guide (scottjosephorlando.com). He also serves as a consultant and recently launched Scott Joseph’s Restaurant Server Training Guide, an online resource that teaches proper skills for food service workers. The American Culinary Federation is a national organization based in St. Augustine with chapters throughout the country, including Central Florida. It was established in 1929 to promote the professional image of American chefs worldwide through education of culinarians at all levels. Written by Scott Joseph on 23 January 2019 . It’s time again for one of my favorite food and wine events of the year, the Field to Feast dinner featuring Disney Chefs at Long & Scott Farms in Zellwood. 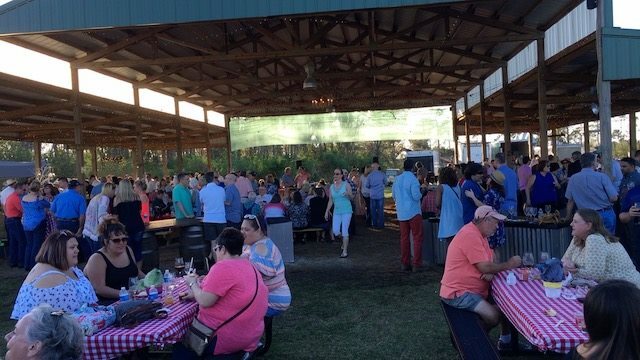 It’s an open-air walkabout event with food stations set up under and around a large covered pavilion amid the various crops grown in the surrounding fields. The 6th annual Field to Feast, sponsored by Edible Orlando with Walt Disney World Resort as a major sponsor, will be Saturday, Feb. 23, from 3 to 6 p.m. Tickets are $175 per person with proceeds going to benefit Kids Cafe Program of Second Harvest Food Bank of Central Florida, an after-school meal service program that provides food to needy children in Orange, Seminole and Osceola counties. In the past five years, the event has raised more than $100,000 for the program.